2NE1 released their latest single, 'I Am The Best (내가 제일 잘 나가)' on June 24, 2011. YG Entertainment then dropped concept photos from the set of 'I Am The Best (내가 제일 잘 나가)' music video. Sandara Park (박산다라) wore the metallic pvc sleeveless dress with a matching vest. Black lamé tights, gloves and a pair Giuseppe Zanotti boots to complete her look. Park Bom (박봄)'s dress definitely made her look like a doll. Christian Louboutin Clou Noeud 150 Studded Slingbacks, Proenza Schouler Oil Silk cuff and black gloves to complete her look. CL (이채린) wore Gareth Pugh outerwear with leggings from the same collection. Hair extentions, rings and a pair of metallic boots to complete her look. Gong Minzy (공민지) also opted for an outerwear. A black long tunic dress, black lamé tights and Christian Louboutin Star Prive 120 Slingbacks to complete her look. 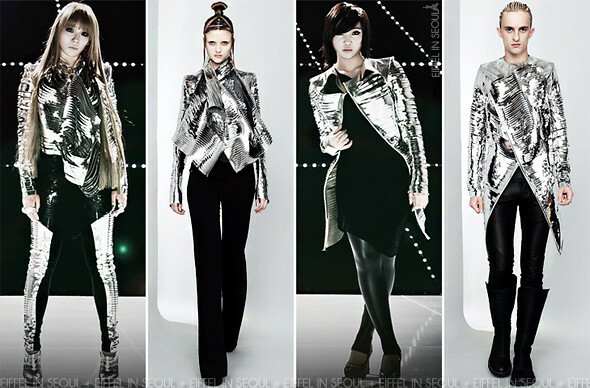 Looking through at the few released pictures on YG-2NE1.com, this has got to be the best outfit coordinated. The girls looked polished. 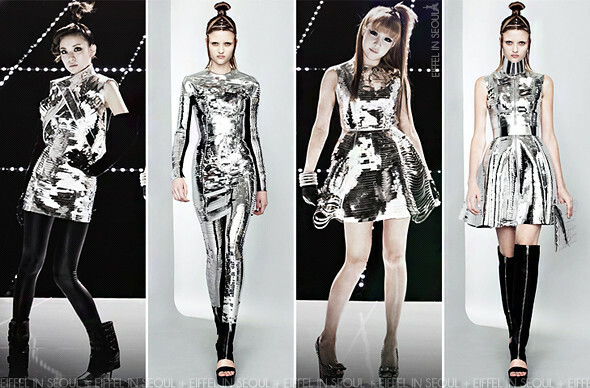 I call them the "Space-Age 2NE1". 'I Am The Best (내가 제일 잘 나가)' is slated to release within the next few days. 2NE1 will make their come-back performance on June 26, 2011 on SBS Inkigayo.